Our Phase 1 clinical trial in Japan provided positive data that enabled an accelerated Phase 2 development program. The Phase 3 TIMES program for Imeglimin in Japan was initiated by Poxel and Sumitomo Dainippon Pharma during the fourth quarter of 2017. The study in Japanese-origin subjects was a similar design to our Phase 1 study conducted in Caucasian subjects. They both included single and repeated escalading doses of Imeglimin. All doses were observed to be well-tolerated with no serious adverse effects (SAE). The pharmacokinetic profile was similar between both ethnicities. Top-line data from our 299-patient Phase 2b trial in Japan were released in May 2017. Results from the randomized, double-blind, placebo-controlled study of Imeglimin administered twice-daily for 24 weeks, demonstrated dose-dependent efficacy on two key measures of diabetes control. The trial achieved statistical significance (p<0.0001) for its primary endpoint of glycated hemoglobin A1c reduction versus placebo in all treatment groups at 24 weeks. In the study, hemoglobin A1c reduction was 0.52%, 0.94% and 1.00% for the 500 mg, 1000 mg and 1500 mg dose twice-daily, respectively. For the study's key secondary endpoint of a decrease in Fasting Plasma Glucose (FPG), the top two Imeglimin doses of 1000 mg and 1500 mg achieved statistical significance (p<0.0001) versus placebo at 24 weeks. In this study, Imeglimin was shown to be safe and well tolerated and the adverse event profile was consistent to what was observed in the U.S. and EU Phase 1 and 2 programs. For more information on the Phase 2b study in Japan, please click here to read the press release. TIMES 1: A Phase 3, 24-week, double-blind placebo-controlled, randomized, monotherapy study to assess the efficacy, safety and tolerability of Imeglimin in Japanese patients with type 2 diabetes, using the change in HbA1c as the primary endpoint. Secondary endpoints of the trial will include other standard glycemic and non-glycemic parameters. 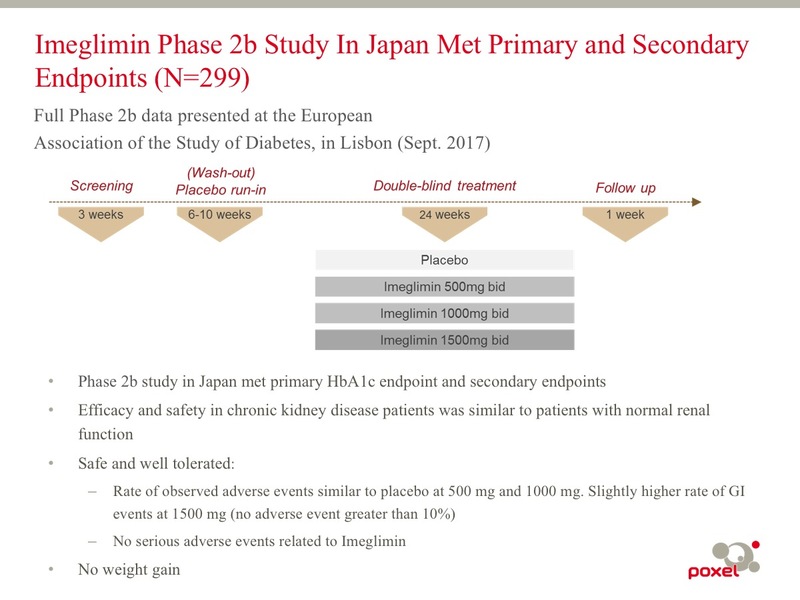 TIMES 2: A Phase 3, 52-week, open-label, parallel-group study to assess the long-term safety and efficacy of Imeglimin in Japanese patients with type 2 diabetes. In this study, Imeglimin will be administrated orally as monotherapy or combination therapy with existing hypoglycemic agents, including a DPP4 inhibitor, SGLT2 inhibitor, biguanide, sulphonylurea, and GLP1 receptor agonist. TIMES 3: A Phase 3, 16-week, double-blind, placebo-controlled, randomized study with a 36-week open-label extension period to evaluate the efficacy and safety of Imeglimin in combination with insulin in Japanese patients with type 2 diabetes and inadequate glycemic control on insulin therapy. 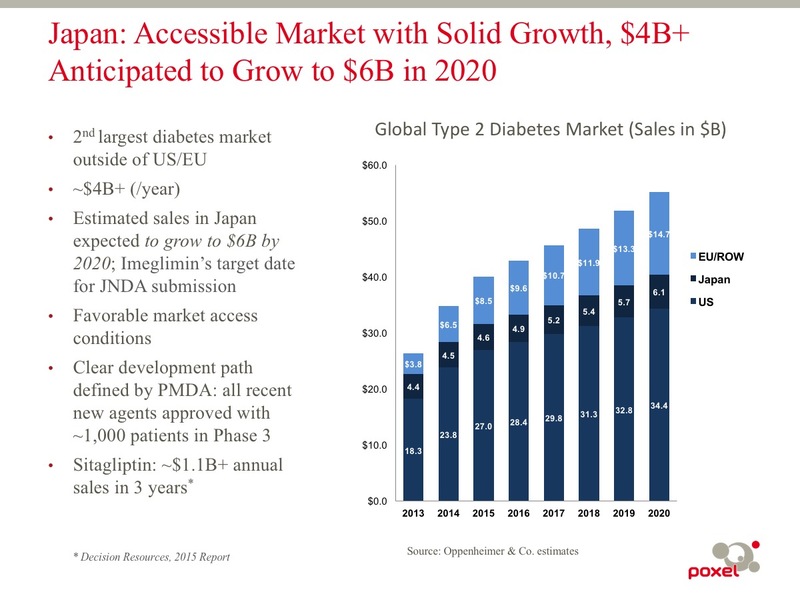 Japan is the second largest diabetes market for major pharmaceutical companies at approximately $4 billion in sales and it is expected to grow to approximately $6 billion in 2020. * The Japanese market is viewed to have favorable market access conditions and has shown a rapid market uptake for new innovative products. Past diabetes drugs approved by the Japanese Pharmaceutical and Medical Device Agency (PMDA) were conducted with Phase 3 programs that included approximately 1,000 patients in their trials. 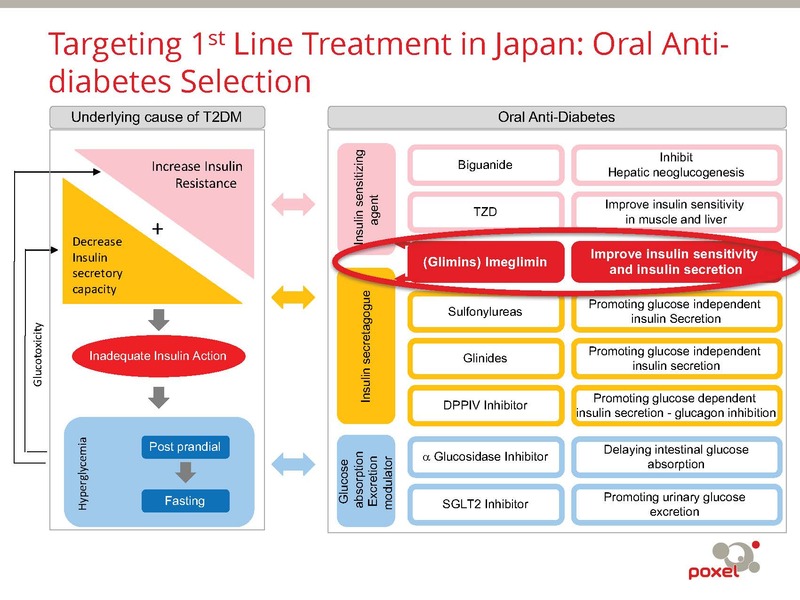 In Japan, cardiovascular outcome studies are not required for regulatory approval for the treatment of type 2 diabetes. Imeglimin is a first in class clinical drug candidate in Japan. If approved by the PMDA, Imeglimin has the potential to become first line treatment in the oral anti-diabetes market. In Japan, China and other Asia countries, Sumitomo Dainippon Pharma is our strategic partner for Imeglimin. 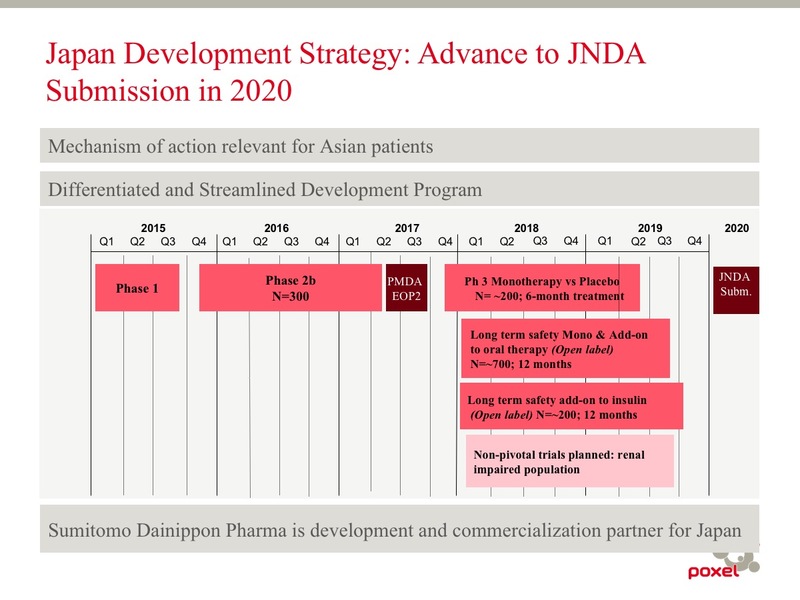 For Japan, Poxel and Sumitomo Dainippon Pharma are jointly conducting the Phase 3 TIMES program, which will be funded by Sumitomo Dainippon Pharma, and Sumitomo Dainippon Pharma will commercialize Imeglimin for this market. In China, South Korea, Taiwan and nine other Southeast Asian countries including Indonesia, Vietnam, Thailand, Malaysia, the Philippines, Singapore, Myanmar, Cambodia, and Laos, Sumitomo Dainippon Pharma will be solely responsible for the development and commercialization of Imeglimin.